The new hybrid offering from Botton & Gardiner marries Refurban Furniture aluminium frames with DuraSlat, an ecologically sustainable wood composite alternative to timber, to offer the ultimate in sustainable street furniture. 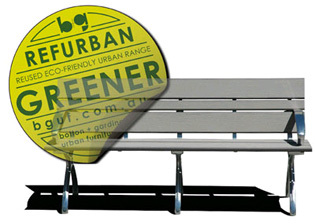 Botton and Gardiner launched its Refurban Program in 2008 as a genuine cradle-to-cradle furniture range for public spaces. Refurban has been well received by the design and public authority community with Integral Energy and Blacktown City Council being some of the first organisations to take up the refurbished street furniture. As measured in a life-cycle-analysis of the products, the Refurban furniture has 97% lower greenhouse gas emissions. The stand out feature of Refurban is that it does not seek to recycle materials, it refurbishes and reuses materials. The company is now taking Refurban a step further by releasing the ultimate response to sustainability in street and park furniture. The new 'hybrid' offering marries the Refurban Furniture aluminium frames with Botton and Gardiner's DuraSlat, an ecologically sustainable wood composite alternative to timber. Botton and Gardiner was the first to bring wood composite slats to market in its Urban Range, and now, as the first to offer a cradle-to-cradle system, customers can choose from a number of truly sustainable street furniture options. As DuraSlat does not require ongoing maintenance, it has seen a strong take-up rate in municipal and other exterior commercial projects. Combining these innovative products is seen as a natural progression toward the ultimate in responsible resourcing and sustainable street and park furniture.